DOES OSHA REQUIRE 10/30 HOUR TRAINING? To date, federal OSHA has not required employees to obtain their 10 or 30 hour OSHA outreach certification card. ARE THERE ANY STATES THAT HAVE 10/30 HOUR TRAINING CARD REQUIREMENTS? Certain states do have 10 and/or 30 hour training, expiration, and renewal requirements. Please read below to see what the different requirements are for each state and contact us if your company is in need of either a 10 or 30 hour certification class or renewal. We have OSHA-authorized trainers available nationwide and would recommend taking the training class in-person rather than online! OSHA 10 hour cards do not expire but certain states listed below do require renewal. Contractors that have employees doing work on a public building project that is being paid for in part, or in full, by state funding or its agencies, where the total cost is over $100,000 are required to have all their employees have an OSHA 10 hour certification card prior to going onsite. 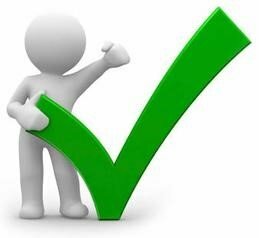 30 days before the contract is awarded, the contractor has to turn in proof that each employee has completed the 10 hour course successfully. Failure to do so will restrict those employees from working on the job. OSHA 10 hour cards are valid for 5 years before the state requires renewal. Miami-Dade County requires all employees of contractors or subcontractors to complete a 10 Hour Construction Course who are working on a County Construction Contract that includes construction, demolition, alteration and/or repair of public buildings or public works projects valued in excess of $1,000,000, funded completely or partially by Miami-Dade County. This requirement also applies to privately-funded projects or leases valued in excess of $1,000,000 for the construction, demolition, alteration or repair of buildings or improvements on County-owned land, and which are subject to Section 2-11.16 of the Code of Miami-Dade County. 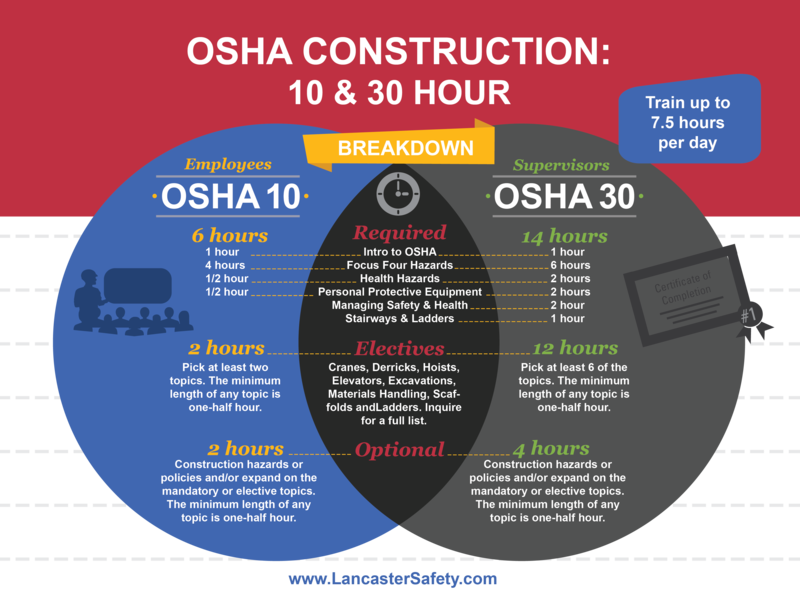 All public sector projects, where the estimated cost is more than $10,000, require each employee to have successfully completed an OSHA 10 Hour Training in Construction before going onsite. It is the employer’s responsibility to make sure all employees furnish documentation of successful completion. Employees who are found onsite without documentation will be immediately removed and the employer can have the contract removed. All employees who work on any public work projects, state or municipal level, are required to have their OSHA 10 hour certification card completed 60 days before starting work. Like federal regulations, OSHA 10 hour cards do not expire. Also, the state of Missouri does not require the training to be renewed. The Construction Safety Training Act, Section 292.675 RSMo, requires all contractors and subcontractors who enter into contracts with public bodies for construction of public works to train their on-site employees regarding the potential hazards they may encounter. The training may be accomplished by providing a standard OSHA 10-hour construction program or a similar program approved by the Division of Labor Standards. All construction employees are required to obtain their OSHA 10 hour card no later than 15 days after being hired. All supervisory employees working on a construction site are required to obtain their OSHA 30 hour card no later than 15 days after being hired. Employers are required to suspend or terminate any employee or supervisor who fails to obtain their proper OSHA certification card within the 15-day period. The employer may also face fines for allowing employees or supervisors to continue working after the 15-day period if the required training has not been obtained. OSHA 10 and 30 hour certifications cards expire after 5 years. As of January 1, 2018, the State of Nevada will require specific workers in the entertainment industry to complete an OSHA 10 hour (non-supervisory employee) or an OSHA 30 hour (supervisory employee) safety and health general industry course and receive a completion card within 15 days of hire. State and local municipality funded projects of $100,000 or more, require that all employees have their OSHA 10 hour certification job before starting any work onsite. Employees who fail to obtain their 10 hour card after 15 days of starting work, will be removed from the jobsite and their employer can face penalties up to $2,500 and a civil penalty of $100 per employee for each day of noncompliance! Any public project where the contract is greater than $250,000, requires all employees to have their OSHA 10 hour training card prior to starting on a jobsite and turn in proof that they’ve done so. Once you have completed OSHA 10 training for work on Article 8 public projects, New York State does not require renewal . However, New York City does require renewal of the training every 5 years. IMPORTANT: NYC March 1, 2018 training requirements update! The City of Philadelphia is now requiring OSHA 10 hour safety training (or equivalent) for ALL workers performing construction or demolition activities in which permits have been issued. This requirement applies to all employees of licensed contractors. Workers will be required to furnish proof of required safety training to Department of Licenses and Inspections officials upon request. Also, ALL Contractors licensed under section 9-1004 of the Philadelphia Code must employ at least one supervisory employee who has completed the OSHA 30 Safety Training, or approved equivalent, within the last 5 years. Identification of a supervisory employee and proof of training will be required for all new Contractor License applications made after September 30, 2015 and for the renewal of all Contractor Licenses set to expire on or after March 31, 2016. Any municipal or state construction project costing more than $100,000 or more, requires all workers onsite to have an OSHA 10 hour certification card and also keep the card on them while performing work onsite. Employees who fail to do so, will be removed from the jobsite and have 15 days to obtain their card. An administrative penalty on any person, firm, entity or corporation for any violation of the provisions of this chapter, in the amount of not less than two hundred fifty dollars ($250) nor more than nine hundred and fifty dollars ($950) per offense on each day in which a violation occurs, or the complaint may be dismissed in accordance with the recommendations. Exempt Employees: federal, state, and municipal government inspectors, and also law enforcement officers who deal with jobsite security or traffic control. Any public improvement project costing more than $50,000 or more, requires each employee onsite to have their OSHA 10 hour certification card. Employees are required to have their card within 21 calendar days after being employed at a public improvement work site. Contact us for more information on OSHA 10/30 hour requirements and training or any other worker safety and OSHA-related question! WHAT SAFETY TRAINING IS REQUIRED BY OSHA AND HOW FREQUENTLY IS RETRAINING NEEDED? Download our free infograph to find out!